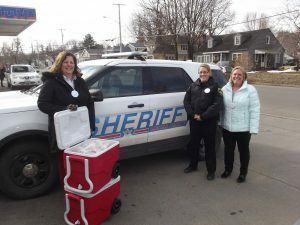 OSWEGO COUNTY — The Oswego County Sheriff’s Office and the Oswego County Office for the Aging helped deliver meals to seniors who participate in the Home Delivered Meals Program this week as part of Nutrition Awareness Month and the March for Meals campaign. Getting ready to deliver meals to seniors are, from left, Sara Sunday, OFA Aging Services Administrator; Oswego County Sheriff’s Deputy Kristy Crast; and Lori Halstead, OCO Coordinator of Nutrition Services. The annual campaign, in conjunction with Oswego County Opportunities’ Community Champions Week, is one of the many ways in which local agencies are raising awareness of senior hunger and the benefits of the Meals on Wheels program. In addition to helping deliver meals to home bound seniors, volunteers have also served meals at OCO’s dining and activity centers throughout Oswego County. Office for the Aging Administrator Sara Sunday helped Sheriff’s Deputy Kristy Crast deliver meals to Oswego city residents. 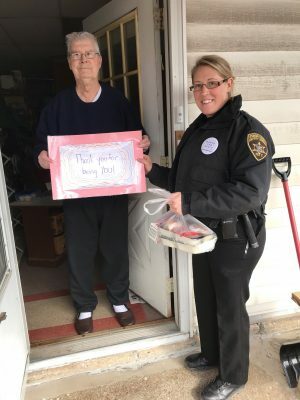 Deputy Crast is assigned to the Sheriff’s Office community relations team and delivers meals to Oswego residents when it doesn’t interfere with a priority call. 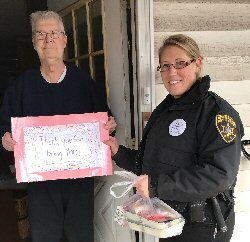 Deputy Crast delivers a meal and placemat to Oswego resident Walter Gross as part of the March for Meals campaign. Students at Fairgrieve Elementary School made placemats for seniors. Home delivered meals are available to any Oswego County resident age 60 years or older who is incapacitated due to illness, surgery, physical handicap or advancing age; is unable to prepare their own meals; and is without support of family, friends or neighbors for meal preparation. Services are available without regard to income. 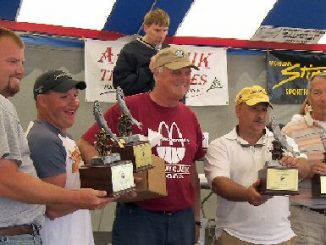 The program is funded by Oswego County government, the Administration for Community Living, New York State Office for the Aging, and United Way of Greater Oswego County. Administered through OCO’s Nutrition Services, last year the Meals on Wheels program delivered more than 1,000 meals a day and provided 227,630 home delivered meals to 820 seniors. Sunday said that everyone who receives a meal has the opportunity to contribute. The suggested contribution is $4 per day for a double meal. Nobody is refused service for inability or unwillingness to contribute. For more information, visit https://www.oco.org/.